Graffiti can be difficult to remove, depending on the surface it is on. Many graffiti removal and restoration efforts can leave surfaces looking as bad, or worse, than before the work began. Each application is different, thus requiring specialized cleaning agents and a working knowledge of how chemicals interact with various surfacesTikko only uses biodegradable chemicals to remove graffiti. Graffiti on walls and surfaces is never the same and can take many forms, such as paints, waxy substances, chalks, felt-tip markers, ball point pens and adhesive labels which are all difficult to remove with normal cleaning methods. Poshfloors Specialist Hygiene’s graffiti removal and prevention services provide a cost effective solution helping you to adhere to relevant legislation whilst returning your surface to its original state. An anti graffiti solution is then applied to your walls and surfaces. This helps ensure further graffiti attacks can be treated quickly helping your property remain clean and free of graffiti which helps to improve its appearance. Whenever possible, the original appearance of the property will be retained or restored. 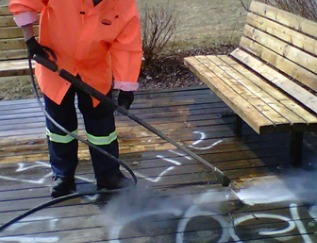 After the area has been cleaned, anti-graffiti coatings can be applied. These can either be ”catcher coats” consisting of silicone/wax or water-based polysaccharide compositions or chemical-resistant coatings. All our staff is highly trained with many years of experience. 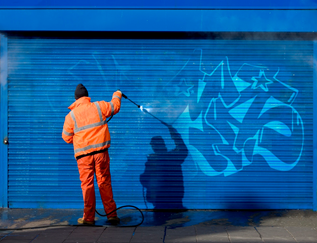 Simply call us on 0845 652 4111 or contact us now to get a free quote for you paint or graffiti removal.